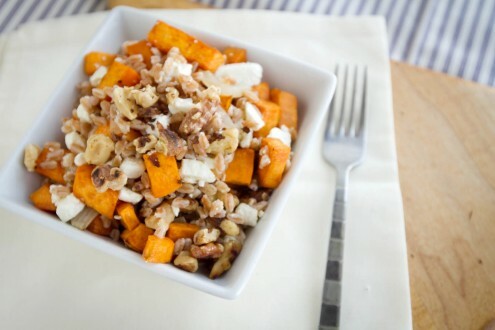 Roasted Sweet Potatoes and Farro | Naturally. Today I leave for a three day/eight school tour in St. Louis. Whoo? I love playing music. I especially love seeing the looks when we play hard lit and the high school students are actually impressed with what we are playing (for any music nerds out there our two featured pieces are El Salon Mexico by Copland and West Side Story from Bernstein.) It will be a lot of playing but it will be fun! Thanks to Heidi, I discovered farro. A nutty whole grain that when cooked has an amazing flavor and pairs well with so many different foods. Farro may take over my love for Quinoa. Instead of her roasted squash I roasted sweet potatoes but everything else is very much the same. It’s hard to change a dish that looks (and taste) so delicious. Check out Heidi’s Recipe for Farro and Roasted Squash! I have seen farro around in a few different places (on blogs) and I would love to give it a try. Any ideas as to where I can buy it? I haven’t seen it at the regular grocery store, but maybe I haven’t been looking in the right places. I usually would get it at my local health food store but my local grocery started has started carrying it (they have a section for grains and gluten-free flours). My best guest for a grocery store would be with the rice area (but that’s really a guess!) Good luck! I’ve been meaning to try farro for a while now but my plans to do so always seem to slip my mind by the time I make it to the grocery store! I’m dying to try this recipe though! I’m crazy for sweet potatoes and this just looks absolutely delicious! Thanks for linking to the recipe and have a great time on your travels! 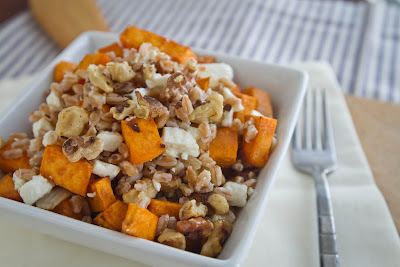 I’ve never tried farro before, but this dish really makes me want to! It looks so delicious!